Apple Store opening in Ottawa! I received an email from Apple yesterday announcing the grand opening of the Ottawa Apple store! Hurry down to the Rideau Center at 9:30 am Saturday July 18th for the Grand Opening! Free T-Shirts for the first 1000 people there! Pogoplug looks pretty cool! Terrabytes of data when you’re on the go! Looks like Pogoplug is now shipping. It’s a cool $99 device that plugs into your home or office LAN, and has a USB port for a USB Disk drive – or a bunch of USB drives. You access your data through a password protected web page – and can upload or download files. An easy way to make a bunch of data accessible over the Internet – to computers or even your iPhone! Apparently there is some sort of plug-in architecture where Pogoplug will be extending the functionality of the unit over time. We are trying to buy one to play with – but shipping charges to Canada being roughly $50, we’re holding off for a bit until we’re on a trip to the US and can get it shipped to our hotel. Looks pretty cool though – check ’em out! Balsamiq Mockups is a great design tool! The app is a riot to use. There’s a large ribbon across the top that contains all the UI elements you can use. Drag ’em onto the canvas, and build a UI in a few minutes. One of the app’s features is a hand-drawn look – which means you can avoid focussing on the nitty gritty details of the design, and instead get the overall layout right. You don’t spend hours wasting time on pixel by pixel spacing, and whether some text should be bold, or a different font. It’s like you’re working with a talented artist who can throw together really great sketches very quickly. And, the app is smart too. The table layout tool is particularly nice – you just type a few rows of text, and it automatically lays it out in a nice table – and automatically converts things like [ ] into checkboxes. Nice. The app is keyboard friendly as well. It’s not obvious, but there are plenty of keyboard shortcuts such as typing “/” to get to a text box where you can simply type the name of the UI element you want added to the page. The developer is extremely responsive to user requests, making extensive use of the GetSatisfaction.com site for user suggestions, soliciting advice for how to implement new features, and responding to any issues. The app is missing a few things, though enhancements are in progress… The app can’t save “projects” of multiple pages. You have to load each page of your design one at a time (although multiple pages can be viewed in the tabbed interface). You can’t add links or automation to your pages – so clicking on things never actually jumps to the new page (like working with a real paper mockup, you just flip to the next page), and you can’t add your own custom elements to pages. One feature I’d like to see is some UI elements for iPhone applications. Many of these features are in development now. Balsamiq Mockups is a highly recommended application! Blog Blazers – How to blog, and what to expect if you do! Our friend Stephane Grenier has just finished writing a new book “BLOG Blazers” in which he interviews 40 well known bloggers – asking an interesting series of questions of each blogger. My favorite question: What was your most successful blog post ever? – It’s very interesting to read everyone’s responses to this question, and to remember reading some of those posts in the past. Stephane has managed to interview some really huge names: Seth Godin, Manolo Blahnik, Jeff Atwood (Coding Horror), DanLyons (Fake Steve Jobs), and Alex Papadimoulis (Daily WTF) – Stephane even manages to interview himself!!! Congratulations Stephane! It’s a great book. The app has a pretty decent list of time variants. Each minute it scans through all the time variants, chooses the ones which apply now, and then chooses a random one of the candidates to be displayed as the time. The whole source for the thing can be seen if you “view source” – check it out, and let me know if you come up with some time variants I haven’t thought of! It’s nice to run this clock in a window on your desktop – and to do that, check out Bubbles! Bubbles lets you run HTML applications as though they are PC Desktop apps. 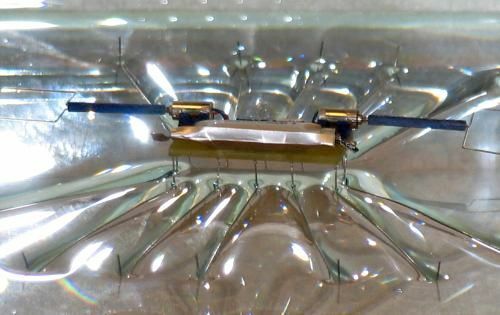 Tiny Robots Hop on Water! Check out this story! Scientists watching how water beetles skim across the surface of a lake have been able to duplicate this behavior in a tiny robot. The robot can skim across the surface at a very high rate of speed, considering it’s size. Use your Wii controller to create an online whiteboard! Stefan pointed out a really cool you-tube video the other day. Johnny Chung Lee has used a Wii controller to create a multi-point interactive whiteboard. The hardware is really simple. He’s simply created a couple of pens with LEDs at the tips and switches mounted on the side of the pen. He then simply points the Wii controller at a screen where a projector is displaying his PC desktop. The Wii controller connects to the PC using Bluetooth. Johnny has written some code on the PC to tie it all together, and the result is astonishing!